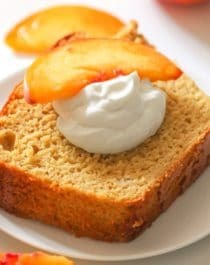 If you like pound cake but don’t want all the butter, refined sugar, and processed flour, try this super light and refreshing Healthy Nectarine Olive Oil Pound Cake recipe! This post was sponsored by Filippo Berio. All opinions are mine and mine alone. Thank you for supporting the brands that keep Desserts With Benefits going! First of all, HEALTHY POUND CAKE?? Yes. Second, OLIVE OIL IN A DESSERT?? Heck yes. It works, mah peeps, it works. Not only does it work, it works damn well. This recipe was inspired by the popular Grapefruit Olive Oil Cake — have you had it? I’m not exactly sure where this cake originates or who first created it, but I tried it recently at a restaurant and was blown away. I wasn’t sure what to think when I read “olive oil” on a dessert menu, but I’m so glad I stepped out of my comfort zone and ordered the cake. I wanted to make my own version of that Grapefruit Olive Oil Cake, but swap the grapefruit out for something else. I had nectarines on hand and went with it — they’re in season and oh so juicy and sweet, of course it’ll be good! I used Filippo Berio’s Organic Extra Virgin Olive Oil in this recipe. I didn’t want an overpowering olive oil flavor, but I also didn’t want to let it go unnoticed — ⅓ cup is the perfect amount. 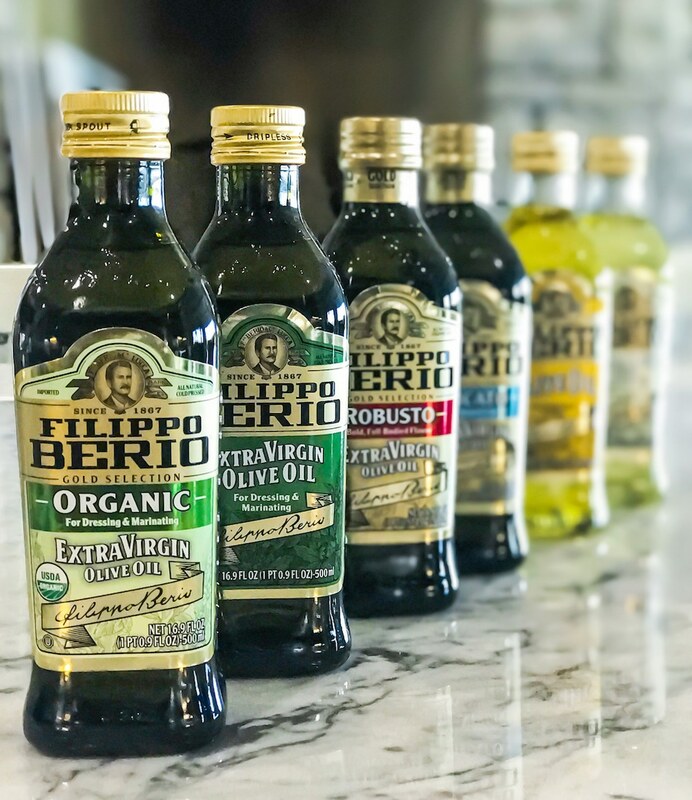 On its own, Filippo Berio’s Organic Extra Virgin Olive Oil is fragrant, fruity, and balanced. To the cake, the olive oil adds a deep, complex richness, while also keeping it light and moist. I like to top my slice of cake with natural whipped cream and fresh nectarine slices for that extra hit of sweet nectarine flavor. It’s a slice of heaven. Is pound cake for lunch, dinner, and/or dessert wrong? Oh well… YOLO. Preheat your oven to 350 degrees Fahrenheit and spray a 9x5" loaf pan with cooking spray. **Rinse the nectarines and dry completely. Slice as much of the flesh off of the nectarines as you can, discarding the pits and stems. Place the nectarine flesh, skin and all, into a high speed blender until completely smooth. 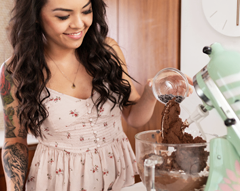 Measure 369g (1½ cups) and pour into a stand mixer bowl fitted with a beater attachment. To the bowl with the nectarine puree, add the yogurt, eggs, olive oil, stevia extract, vanilla extract, butter flavor, and lemon zest. Mix on low speed while you gather the dry ingredients. In a medium-sized bowl, whisk together the whole wheat pastry flour, erythritol, starch, protein powder, baking powder, baking soda, and salt. Turn off the mixer, dump in the dry ingredients, and returned to low speed. When it's about halfway mixed through, scrape down the sides of the bowl, then return to mixing. Mix JUST until combined, do not overbeat the batter. Pour the batter into the prepared loaf pan and bake for ~55 minutes. The surface should have browned, and will spring back when tapped, and a toothpick should come out clean. Let cool in the pan, then slice and serve! 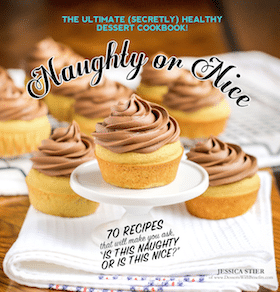 Serve with natural whipped cream and freshly sliced nectarines. Maybe even a little drizzle of olive oil! Can you believe a slice of POUND CAKE has only 270 calories? 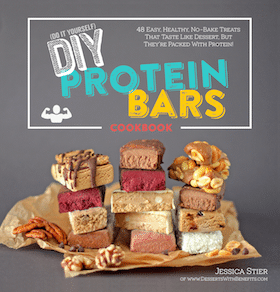 Plus, a pleasantly surprising 5g of fiber and 8g of protein too! As a comparison, a slice of your typical pound cake will come in at around 400-600 calories with about ¼ cup (or more) of sugar per serving… yeahhh, let’s skip all that nonsense and make this healthified version instead. For every sweepstakes entry, Filippo Berio is donating $1 to Careers through Culinary Arts Program (C-CAP), a non-profit organization that provides career opportunities in the restaurant/hospitality industry for underserved youth through culinary arts education and employment. Filippo Berio has been a proud supporter of C-CAP since 1990. One of their main goals is to help foster the growth and development of future culinary leaders. This means a lot to me, as I bake and blog for a living, and worked in the restaurant industry as a baker for nearly 2 years, just barely making ends meet. Filippo Berrio is currently on tour, so if you’re in any of the following cities — Austin, TX, Nashville, TN, and Charleston, SC — be sure to visit the Following Filippo Food Truck Tour! I live in Austin, so I’m going to be swinging by this Saturday to meet the team, taste test some yummy olive oils, and eat some delicious food. Cook, eat, drink, and be merry! 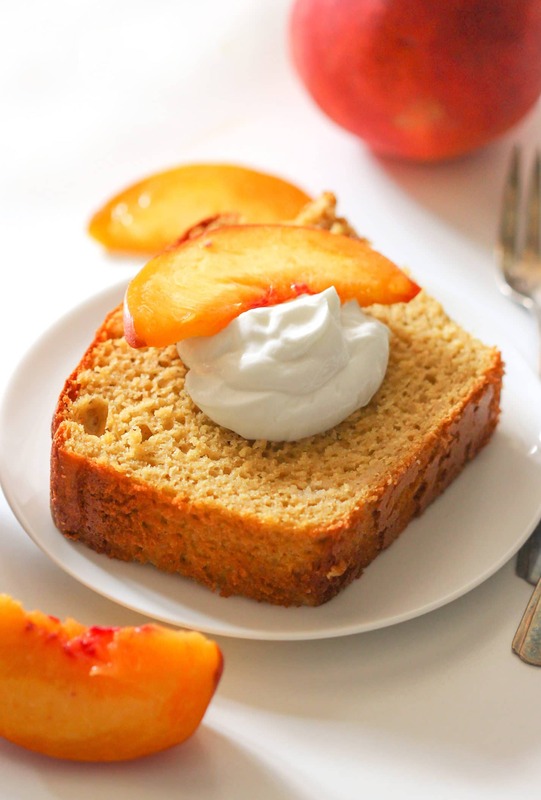 This Healthy Nectarine Olive Oil Pound Cake is sweet, delicious, and 100% satisfying… just like all desserts should be. You’d never know this cake is free from the butter, sugar, and white flour. I think this is the healthiest Pound Cake EVER! I am easily becoming obsessed with olive oil cake. Great idea for a recipe and can’t wait to try this! Yum, this looks delicious. I must try the recipe. The pictures look gorgeous. This looks delicious and super healthy! I’d definitely eat this for all meals! Wow, this is such a moist and fluffy-looking cake! I’ve never actually tried an olive oil cake before. It sounds pretty interesting!